There’s nothing quite like a totally unexpected, but totally good, surprise to put a smile on your face. 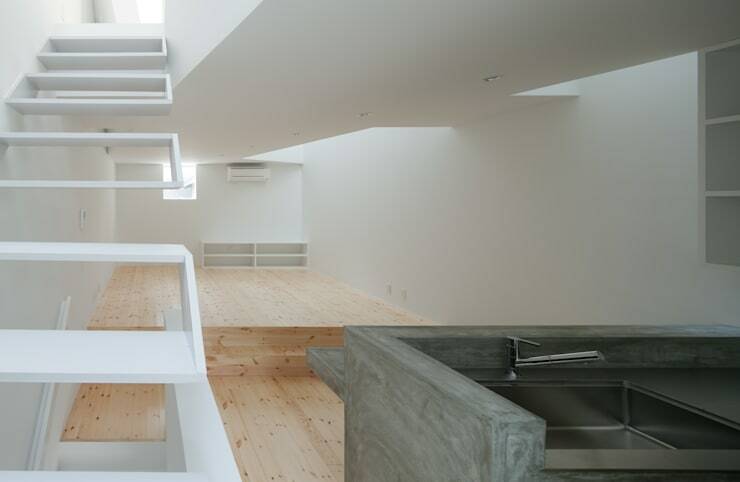 And House in Tamatsu, from Ido, Kenji Architectural Studio, has to be one of the sweetest surprises out there. 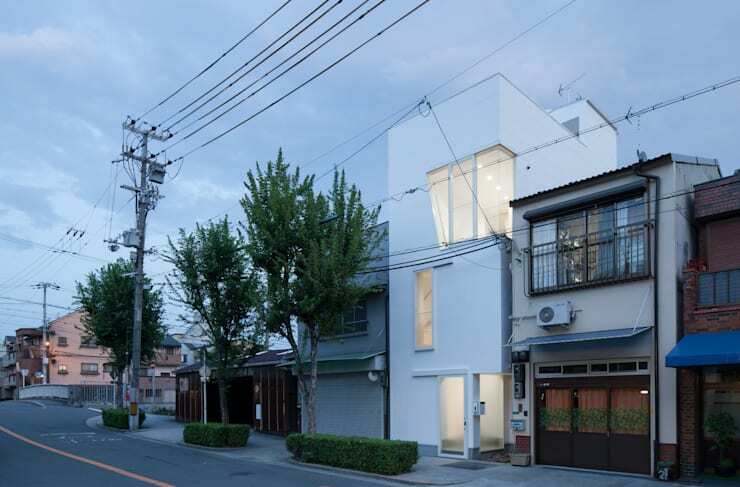 Jammed between resolutely unassuming Japanese houses on an Osaka street, this is an architectural gem in a very unusual location. What’s so special about it? Well, about a thousand things. At least. Join us as we take a look at just a few of them. 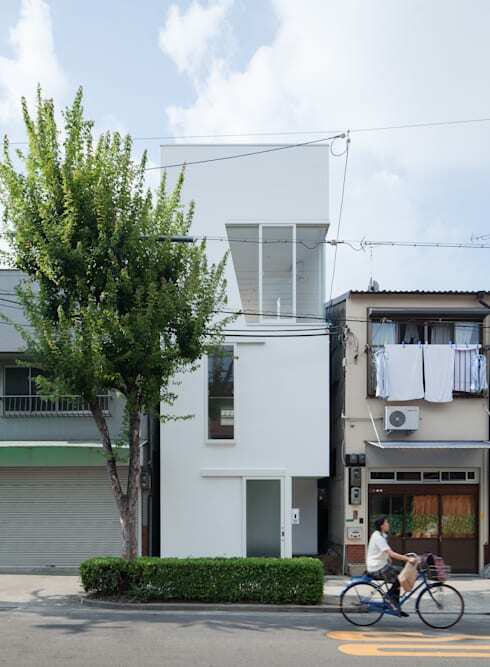 This stunning house shines bright next to its more sober neighbours. Seen from here, the most notable feature of the building – apart from its conspicuous, brand-new-T-shirt levels of whiteness, of course – is the unique shape and positioning of its windows. Those on the uppermost floor are particularly unusual; not only does one of them wrap around the corner of the building, the diagonal cut of the one on the left makes it appear as if it’s been haphazardly sliced. Viewing the building straight-on, its extreme narrowness really becomes clear. 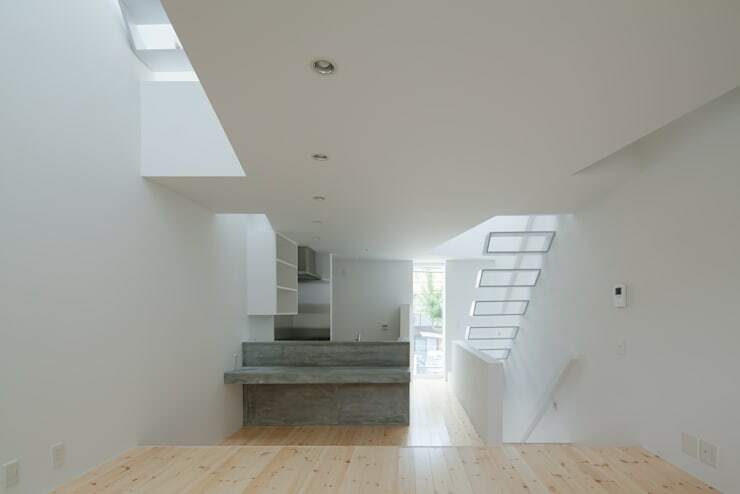 It’s already obvious that the architects must have made extremely unconventional use of space in the interior. Those with high expectations for this home should be anything but disappointed once they see what’s inside. The interior is a minimalist masterpiece of light, lines and angles – the sort of thing that an architect might sketch on a whim, but which is incredibly challenging to bring to life. But in this remarkable house, exactly that has been achieved. This shot shows the kitchen area, with a staircase at the right-hand side leading up to the next floor. The kitchen and the living space beyond have been designed to be outfitted with the perfect minimalist furniture. Any other style would be completely out of place here, and would ruin the effect the architects worked so hard to create. 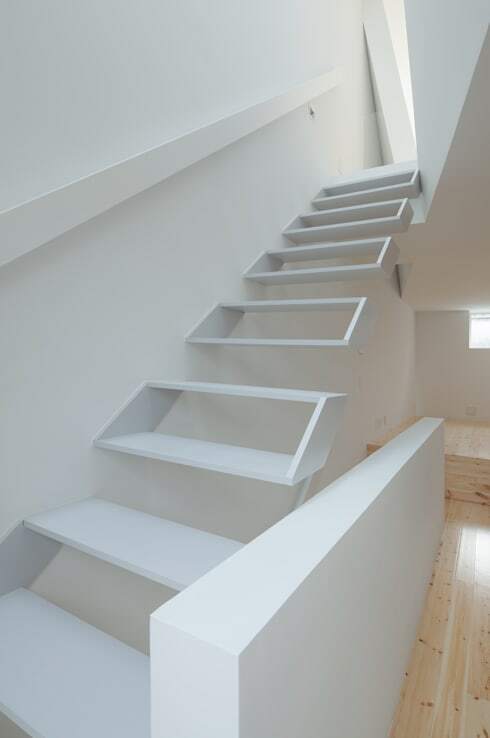 The staircase is totally unlike any other, having been created out of hollow boxes that are supported only by the wall. Ascending this staircase, made as it is out of almost nothing, must be as close as it is possible to come to flying. 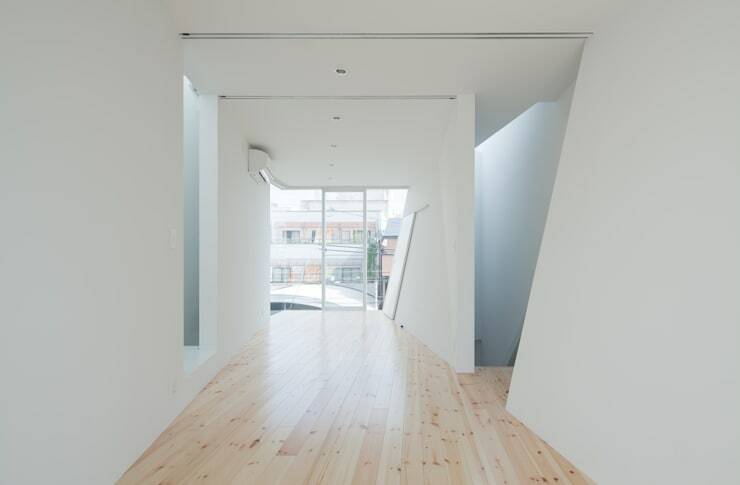 Up above, the odd, asymmetrical angles of the windows and doorways causes light to enter the building in strange, sharp slices. 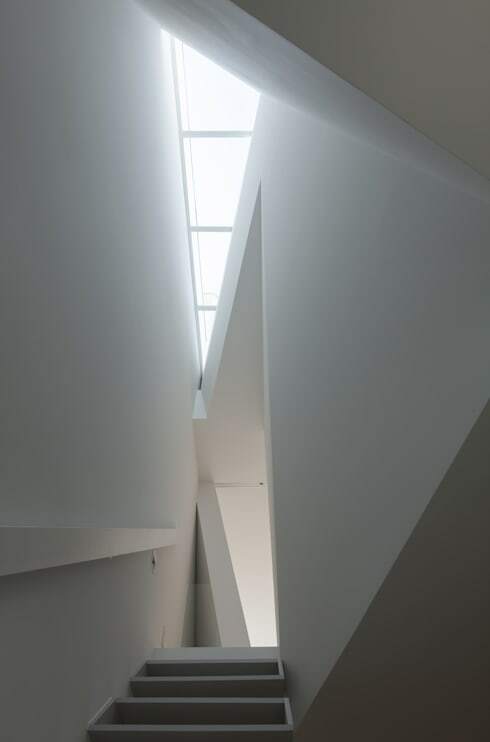 The dispersal of light is every bit as odd and unpredictable in the rooms themselves, with angled windows and jutting sections of wall combining to create a slightly disorientating feeling, as if the world might be tilted. 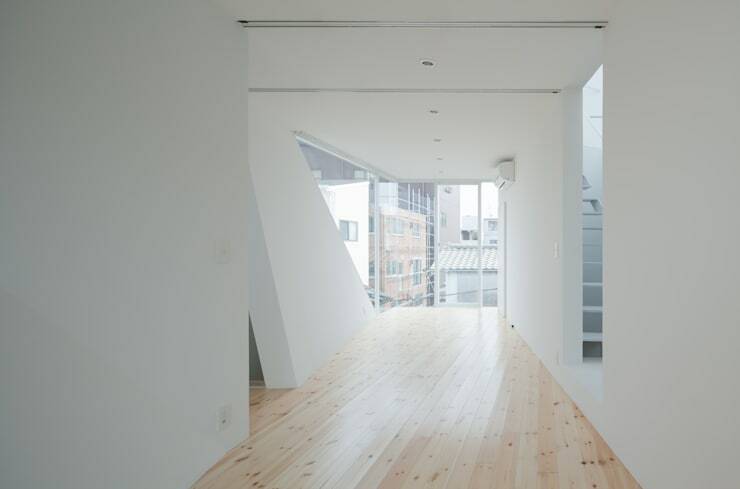 Each room, though different in its shape, plays with space in the same confusing manner. Only the bathroom, a smooth grey cement box where lines run parallel and corners form 90° angles, offers a refuge from the dazzling whiteness and creative geometry of the rest of the building. 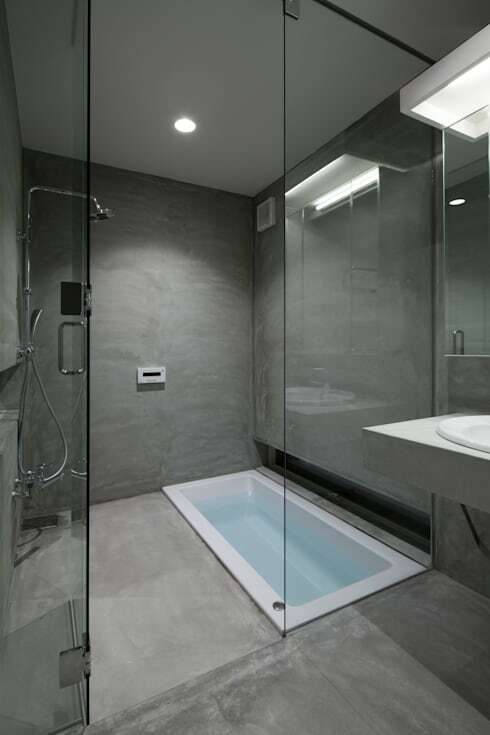 This room too, however, make its own powerful minimalist statement, the bathtub stripped back to its most basic form: a sunken rectangle in the floor. 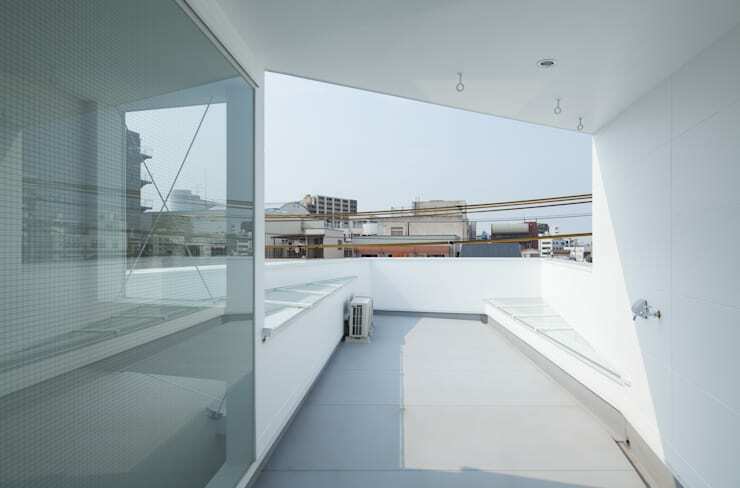 At the very top of the building a small roof terrace, partially covered, provides some precious outdoor space for the inhabitants of this house. Naturally, even the seating provided here takes the form of acute triangles. How do you feel about this house? What other interesting examples of minimalism have you seen recently?